Acts of hate — for the first 400 per the Southern Poverty Law Center, I could name many that I had seen covered by the media. Then I noticed the count exceeded 700, and I realized I knew very little about those additional 300. Reporters critique their own paper’s coverage of Trump, then delete it (see below tweet which disappeared overnight, after 2k+ retweets). The media, including traditional media, covered an alt-right conference and published their demands, which included a ban on immigration for 50 years of anyone not white, and an all white nation. Major media following Trump’s reality show storylines, instead of reporting as traditional media/journalism. Democrats advocating for a Mitt Romney appointment to Secretary of State — a man with whom we agree on almost nothing on policy, but because he is competent and not a racist or a bigot. The pace of untraditional, unorthodox acts, and conflicts of interest by Trump are coming so fast and furious, they’re barely getting coverage. Utter outrage by the left at the complacency and largely silence of our elected leaders. Watch of a Tea Party-esque type uprising. A request for tolerance for, and understanding of, white supremacists. 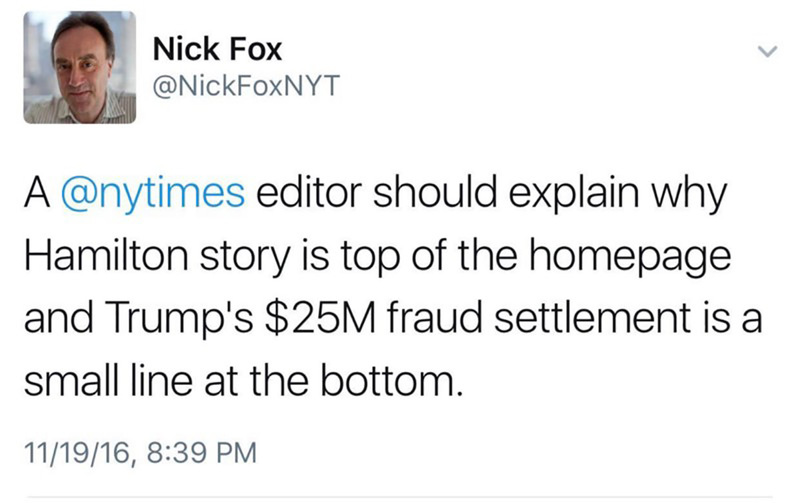 This tweet critical of the New York Times disappeared overnight.